There is no set right answer for which type of gold is best to buy. Your plans as a buyer will play the most prominent role in determining exactly which type of gold is most ideal for you. The best purchasing decision for one guy isn’t always going to be the best for someone else. It is always important, in any form of investing, to make decisions that are most fitting for your own interests. You can’t go out and buy tubes of coins because a collector does, simply because an investor won’t have the same motives as that collector. With all of that said, we have outlined what would typically be considered the best type of gold to buy depending on a handful of different variables. Use these guidelines as an outline when deciding what you would like to add to your bullion portfolio. If you are a brand new buyer of gold bullion, the variety of gold options can seem overwhelming. There are rounds, coins, and bars, but what makes one better than the other? In the end, gold is gold, and that is one of the most important things to remember. You are seldom going to go “wrong,” per se, but you could make an order that was less than optimal. As a new buyer, you should be looking for items that are both the easiest to buy and sell. Who knows, you might want to sell your bullion somewhere down the line. As a result, you should purchase items that are the easiest to unload. 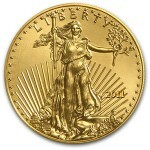 For someone who isn’t all that familiar with gold items, the top choices include bars and the most popular coins. Bars can be obtained in very small sizes and will generally cost a minimal amount over spot price. This means that more of your money will be going to the metal itself and less of it will be going to premiums and markups that sellers and dealers add to generate a profit. Bars in gold can be had in sizes as small as one gram, and sometimes even less. This makes them very affordable even for the buyer or investor who is on the tightest of budgets. If you want to get the most pure gold for your money and don’t know where to start, go for bars. The most popular and respected coins are the second best place to put your money if you are new to gold and aren’t quite sure what you should buy. The top two coins are the American Gold Eagle and the Canadian Gold Maple Leaf. There is a good chance that you have already heard of these, even if you aren’t an expert on coins and bullion. These are premier choices for newer buyers because they are easy to find and commonly traded. If you seek out Chinese or Australian coins, you will have a tougher time locating the items that you want, you will pay higher premiums, and you are less likely to sell them for the same profits that Eagles and Maples will return. If bars are a bit too generic for you, coins are a fantastic way to go. Investors looking for the best type of gold really won’t have many difficult decisions to make. Assuming you are paying fair market value, there isn’t any type of metal that is going to be detrimental to your investment. Rounds and bars are the items that you will go after if your goal is to obtain the most actual bullion for every dollar you spend. There is absolutely nothing wrong whatsoever with investing in coins, though. The primary aspect to note with coins is that they are virtually always going to carry a significant premium by the ounce. While bars and rounds sell for spot price plus a few dollars, coins often times have premiums that are $20, $50, or even hundreds of dollars by the ounce. The reason for this is the numismatic and collectors markets that are wildly popular around the world. A round of gold is easy to produce, has no real scarcity, and is not unique. If you buy a special coin minted by the United States, though, there is real value that exceeds the weight of the gold itself. The chances are that you will actually make money on the premiums that you paid with your initial purchase, but then their is always the risk that you will lose some money as well. If you want to exchange a little bit of risk for some bigger rewards, go for coins.